I guess getting my binders organized last week has spurred me on to bigger and better things! I am reading a book on organization by Sunny Schlenger and ideas are "clicking" for me in a few new ways, so I hope to continue getting things done! It feels great! I really have accomplished a lot! 1) On Thursday we FINALLY had our dishwasher and garbeurator installed! When we bought the house we knew there was no dishwasher and I said to Shane that it would have to be the very first thing we did. Well...it has taken 18 months and lots of other things were done ahead of it, but it is finally in. I am listening to it's oh-so-quiet hum right now. No more dishpan hands for me. Yay! I used this collection of papers from CM, some chipboard embellies from the dollar store, a few buttons and a scrap of ribbon. 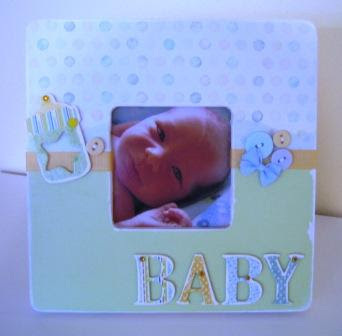 Easy and inexpensive gift idea...even though this one is staying in Sam's nursery! I guess I have to put more frames on my TO-DO list now! The best thing of all about Sam's new nursery is that he is actually sleeping in it. The transition from beside/in my bed went quite well. He had naps in his new crib on the first day, then he slept from 8:00 pm until 12:30 am on the first night, until 4:30 am on the second night and then all night last night! Sleep may be returning to our house after all (and that is probably why I actually have enough energy to do some of these projects around the house). 3) I sorted and organized my clothes and moved them into our bedroom closet. (I had been using the extra closet in Sammy's room, so I had to get out!) The problem was that I had four sets of clothes...pre-maternity fall, maternity, pre-maternity spring/summer and the few things I had to buy this summer because nothing fit me. So it took a while to figure out what fit and what was appropriate for the season and for a SAHM. I got rid of a lot by taking it to the Salvation Army, and I always feel good about giving things that I can't use away. Now my clothes that actually fit and work for my lifestyle right now all fit into my half of the closet in our bedroom. It sure makes it a lot easier each morning to get ready for the day. 4) We vacuumed out the newly created storage room in the basement and brought in some of the shelves from the garage. Then I put away a lot of the boxes that have just been hanging around while we did the renos. While I am not finished this task, I am pleased by the space I have freed up and by how accessible the boxes are now that they aren't stacked on the floor. Alas, I did not work on my scrapspace yet...maybe this week!! !